IT was on this day, 131 years ago, that Celtic Football Club was formally constituted in St Mary’s Church Hall in East Rose Street, Calton. As we mark the anniversary of the formation of our club, Celtic FC Foundation is delighted to launch its 2018 Christmas Appeal. The Appeal lies at the very heart of why our club was formed and honours the founding principles which were set out that day in 1887, as we aim to continue to help those in our community who are most in need. Once again, the club has provided fantastic backing to the Appeal by kicking it off with a wonderful donation of £10,000. The Celtic Family is renowned for its generosity and compassion and we are requesting your support once again, to get behind this year’s Christmas Appeal and help us to provide comfort to those in our communities. - Founding Fathers’ Fast which will take place today, Tuesday, November 6. - Celtic Sleep Out, Glasgow, on Saturday, November 17 and the Celtic Sleep Out, London, on Friday, November 23. - Ghirls for Good festive extravaganza on Saturday, December 1. - Our annual Christmas Appeal matchday bucket collection at the SPFL Kilmarnock match on Saturday, December 8. - Light Up the Clover event at the FC Salzburg UEFA Europa League match on Thursday, December 13. This year’s Appeal will also see the introduction of a brand new initiative, with our ‘Celtic FC Foundation Letter from Santa’, as supporters have the opportunity to receive a colourful, customised letter for their child - look out for further details coming soon, all the way from the North Pole! Finally, we will be hosting another eBay Christmas Appeal charity auction in December, and full details will be provided shortly. Celtic Chief Executive Peter Lawwell said: “Celtic is delighted to kick-off this year’s Christmas Appeal with a £10,000 donation. The Club and Foundation are totally committed to helping people in real need and at a difficult time of the year for so many, we hope that through our work we can bring some Christmas cheer to those who really need and deserve our support. Celtic FC Foundation Chief Executive, Tony Hamilton, added: “Through our Christmas Appeal we aim to follow in the footsteps of our Founding Fathers, by providing support to those who need it most. For many people, the struggle today is just as real as it was in 1887. “Thanks to the generosity of the Celtic support, last year’s Appeal allowed us to help more people than ever, as we were able to provide support not only to families and charities in Glasgow, but also other parts of the UK and Ireland, as well as overseas. “We hope to achieve this once again through this year’s Appeal and Celtic supporters across the world and those who are simply drawn to the Celtic story play an integral role in helping us to achieve this. So together, we can make dreams come true this Christmas. Here is a reminder of the incredible difference you made in 2017. 7. Take part in the Founding Fathers’ Fast today, November 6 and donate £5 through one of the outlets above. 12. Contribute via our Christmas Appeal eBay Auction, of which all proceeds will be donated to the Appeal – further details to follow. 13. Take part in our Light up the Clover event on Thursday, December 13 – further details to follow. 14. 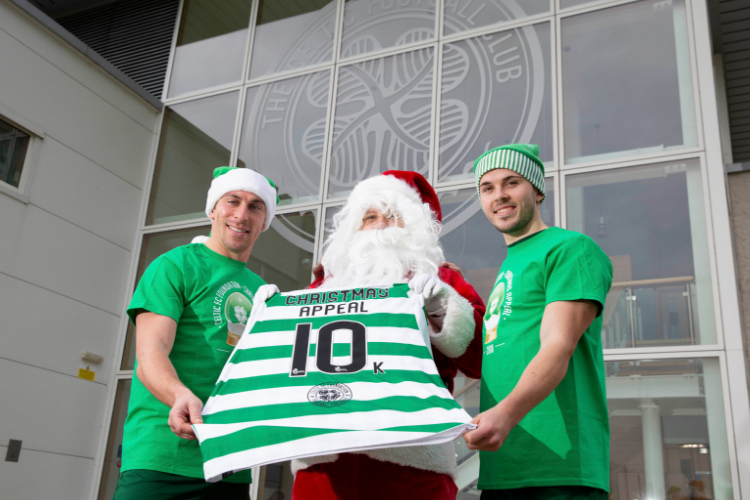 Make a donation to receive your ‘Celtic FC Foundation Letter from Santa’– further details to follow.